There is no better way to celebrate than with food and nobody lives by this statement more than a Bengali household. Whether it’s a Sunday evening adda with the elders gathering for the routine chaa and gossip about the latest political catastrophes. 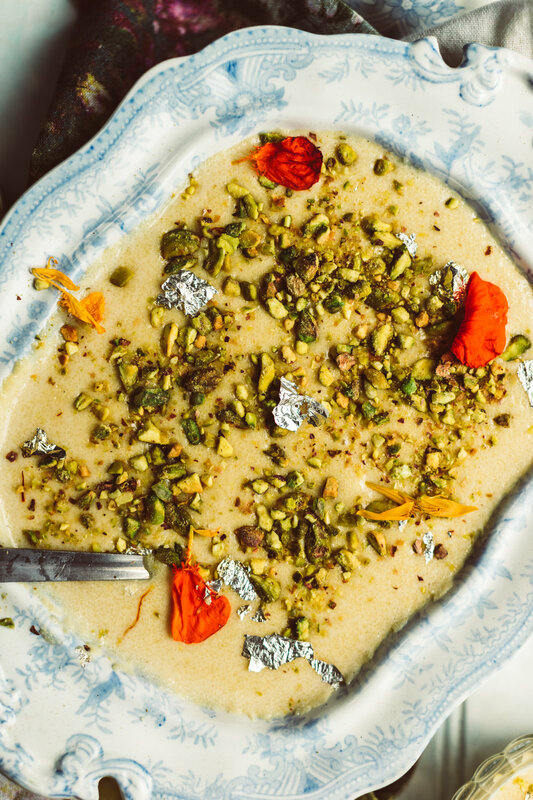 Food is at the core of every important life event for us and one of my favourite desserts that punctuates great wedding memories is sooji kheer. A popular one at Bengali weddings afters dozens of courses of spicy dishes, kheer is a great way to cool off and relish in something sweet! In a non stick pan, bring 400ml evaporated milk to a gentle simmer over medium heat. Add the sugar, spices, bay leaves and rosewater and stir gently for a few minutes to avoid the milk burning. Finally add the rosewater and a small pinch of salt to balance the sweetness. Add the semolina in, a tablespoon at a time. If you prefer a smooth pudding, use 100g of fine semolina. I prefer sooji diye kheer to be a little grainy so I mix two types of semolina. Lower the heat and stir continuously to avoid the bottom from burning. If the semolina thickens too much, add the extra whole milk and continue stirring. It is better to have it a little on the runny porridge side of things as it’ll set. Remove the bay leaves before taking off heat and transferring to a heat proof dish. Once the kheer has cooled down, allow to chill and set in the fridge for at least an hour. Sooji diye kheer is best served cold. Note: optional toppings include traditional edible silver leaf and pistachios. You could also try edible flowers like nasturtiums and pansies!